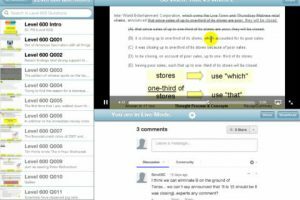 There are plenty of applications you can download to your iPad to translate from one western language to another. But if you happen to know and speak some of the less popular languages around, you are going to have a more difficult time finding decent dictionaries and translators for your language. 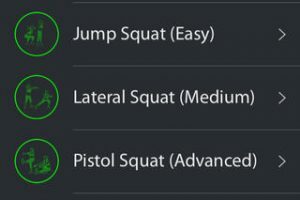 FastDic Persian Dictionary is a cool little app that brings an English to Persian (and the other way around) dictionary to your tablet. FastDic offers more than 80k words. It has British and American English phonetics (it does not offer audio pronunciations). 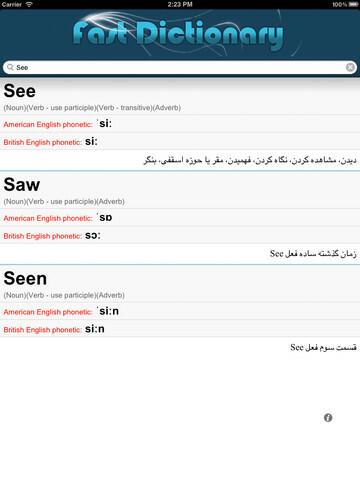 You don’t have to struggle to enter Farsi words into this app. This application downloads its data to your tablet, which means you won’t need an internet connection to use this tool. The user interface does not have too many eye candy features. But it is simple enough for users to get started with quickly. 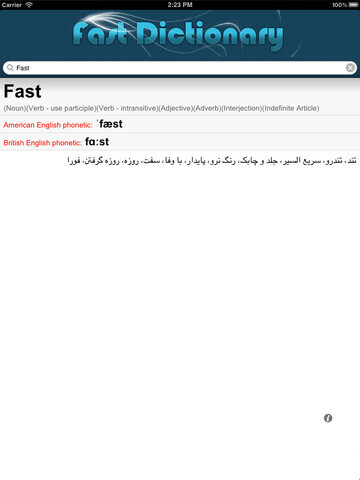 FastDic is a nice Persian dictionary for iPad. It would be even better if it offered pronunciations. The app is offered for free at the time of this writing. It has potential.